Some interesting mentions in the "50 Most Innovative Companies" Fast Company cover story. 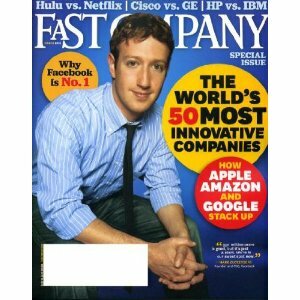 Yea, Facebook, Google and Apple (among others) are all innovative and interesting companies, but the ones on the list that stood out to me weren't because of who they were, but because of what's described in the Fast Company writeup. Also of note from this issue of Fast Company was mention of the video sites Fora.tv and Ted.com. I've certainly heard of both sites beforfe... maybe someday I'll actually spend some time perusing them.